Bobby Brust is widely recognized as one of the leading psychic mediums of the day. He has a unique and powerful ability to communicate with spirits on the other side. This is his story and the story of the many people he has assisted with his amazing gift. 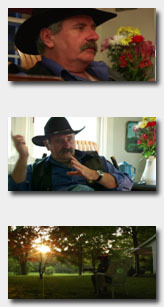 This DVD, which runs over thirty-three minutes in length, documents Bobby's early life as a psychic medium as well as his insights into what spirits want and what people want when they ask him to connect with family and loved ones on the other side. "Written and directed by award-winning documentary producer Robin Eichleay, with videography by theatrical and TV commercial director of photography Adam Honzl, this program includes actual readings and testimonials from near and far from individuals Bobby has read for. “The Life and Times of Bobby Brust” offers an honest and unembellished behind-the-scenes introduction to what Bobby does, how he does it, and how he has helped so many people find closure and peace. Price of the DVD including USPS First Class shipping and handling is $19.95. To order by Paypal Account or Credit Card go to www.paypal.com and send payment of $19.95 to CAPthatProductions@comcast.net. Be sure to include your shipping address. To order by check or money order send payment to CAPthat Productions, P.O. Box 14, Lakeland, MN 55043-0014. For quantity orders of this DVD or information on usage rights to this production, contact Robin Eichleay at CAPthat Productions: CAPthatProductions@comcast.net ; 612.860.2783.